Valeader Pneumatics have been trading since 1978 and have a proven track record for providing an efficient and reliable service to its customers. We are also ISO 9001 registered. We are suppliers of the Dynamco range of Valves and Fittings, the Flo-Control range of Solenoids Valves, as well as Aventics and Camozzi components. Our specialist will also be able to assist you with any equipment tubing you may require. 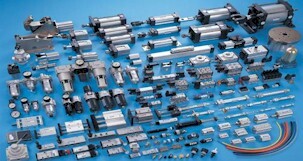 We also supply most other makes including Festo, SMC, Joucomatic, Herion, Origa and many others. Along with the manufacture and testing of the Dynamco and Flo-Control valves, Valeader Pneumatics also have the facility to build sub assemblies to their customers individual requirements. Renowned in the industry as a leading distributor of Pneumatic components and associated products, we stock, market and distribute a wide range of high quality fluid power products. With over 30 years experience, we can offer innovative and unrivalled connection solutions for pneumatic, hydraulic, water and gas applications. Our sales and technical advisors are dedicated to providing customers with full product support. They are experienced and technically qualified in all aspects of the fluid power market. You can be confident that they will find the best connection solution for your application. We have a large warehouse and workshop facility. We hold the majority of our items in stock and can deliver quantities of any size. Our fully equipped workshops are designed for our engineers to build and test assemblies to our Customers individual needs. Our ordering and delivery options are easy and flexible so they can be tailored to suit your individual requirements. We also have a fully stocked trade counter where knowledgeable staff will help you to find an immediate connection solution.